In 1907, for installation of the cable car atop Pikes Peak in Colorado, USA it was necessary to put a water supply line. A narrow gauge railway track atop wooden sleepers had to be prepared. It has about one and a half kilometer steep climb, but straight track was used to supply the material.The area became a famous tourist destination by the time the water pipeline project got completed. In 1990, the track was damaged due to rocks sliding. To rectify the damage entry got banned for a short time. Railways refused to repair the track and the track got removed after their refusal. Now a days, the entry to the Incline is free. Perhaps, because it turned out to be a health building place for one and all. Over the years, the spot became famous for tough, physical workout. It is common to see all levels of runners and cycling lovers. The area serves as a free, open air workout gym with unlimited beauty and scenic views. The public comes at any time but usually in the morning and evening to spend their precious time. It takes between 30 to 60 minutes for the 2000 feet to ascending & descending the average time for a workout. 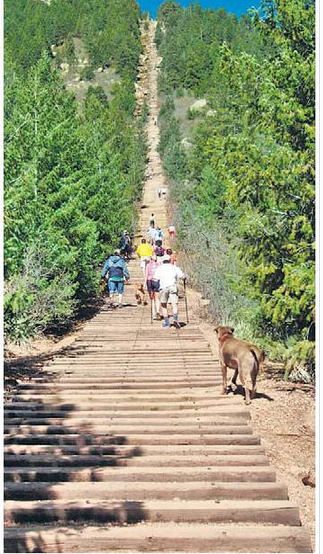 Another name of this place is Manitou incline. It is known to be the most famous tourist center now days in Colorado Springs area for young and old alike. The big reason for tourist streaming in is that the place is within the Spring valley of Colorado that is full of natural beauty and surroundings.